Our busy week continues with a violin recital for Frances last night. She had a recital at her school last week, but this one was city wide. She is taking lessons through a partnership with a local university. Their teachers come to each of the schools twice a week for 45 minute group lessons. The whole year's worth of lessons was $75, and kids on free and reduced lunches can take classes even cheaper. 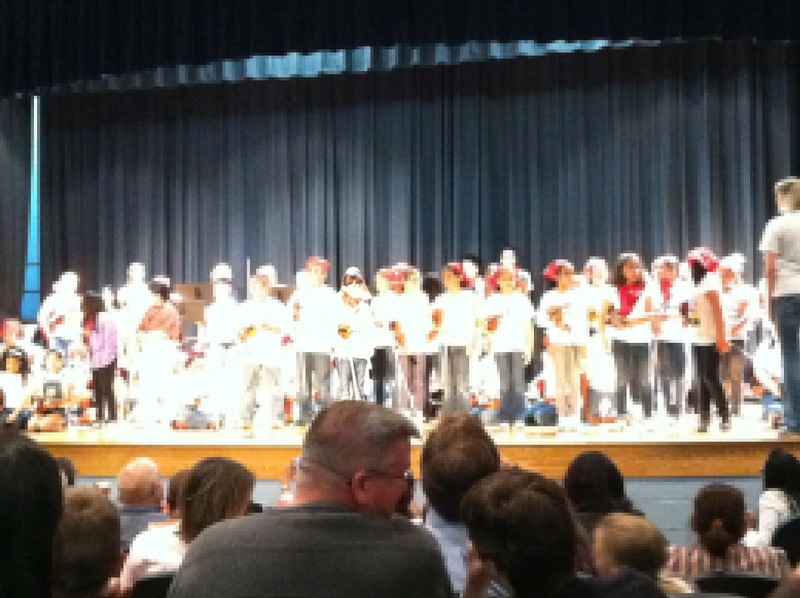 It's a great program to get instruments into the hands of kids at an early age. The program starts in third grade and now continues up through high school. I know that a musical education is important for kids, but I always worried about what that instrument would be. We don't have room for a piano and brass instruments intimidate me. (My mom was a trombone player, though!) I had honestly thought that lessons would be out of our reach both financially and time-wise, but having inexpensive lessons right at her school has been a true Godsend for us. Frances LOVES the violin and I think she is doing really well. She doesn't practice as often as she should, but I'll take a lot of the responsibility for that in that we haven't been good about reminding her. In the performance last night she was front and center stage for the duration. I asked her later if she was nervous, and she sounded confused as to why I would think she was nervous! She loved performing!! I also got a picture of her with her teacher. Thanks so much for all you've done this year, Ms. Megan!! Congrats to Frances! And the clip was adorable!